Been a bit wet and grey for the last few days. No sooner had I finished updating the blog on Sunday, mentioning the isolated showers and how cleverly I had avoided them (see Isolated Showers, 22nd June), when the rain started to fall. There's been plenty since then. It's raining now. Actually yesterday was OK most of the day, we had customers out diving who had good conditions. There was quite a strong wind on Sunday night and Monday, it's calmed down a lot now. It's taken about 4 days to get dry laundry! Watching the rain again. Too wet to go out, too wet to play ball.. certainly too wet to ride home on bike. And it had been quite a nice day! Watching the rain. Heavy rain. Lots of rain. Drinking cold Tiger Beer. The rain is falling... just updated my weather blog saying how I have cleverly avoided the rain all day. Bugger. 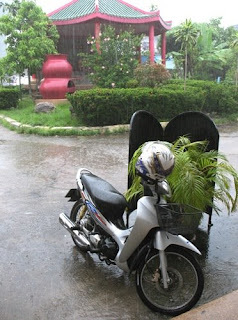 I was not the only Phuket blogger to notice the rain... Teacher Mark Jochim had a Rainy Day on the 24th (Tuesday). He says "I could see this storm approaching early this morning. When the Big Buddha disappeared behind a dirty-gray gauze just after six I knew we were in for it. The entire sky turned white, not even a patch of blue could be seen over southern Phuket (from my balcony, I have a view that stretches east towards Laem Panwa, south towards Ao Chalong, and west broken by the spine of high hills that bisects the island). The sheets of rain came just a few minutes later, accompanied by howling wind." It was indeed a rather soggy morning on Tuesday. My wife and I spent an hour sheltering in the Phuket Immigration office where we were renewing my 1 year visa. A nice immigration official walked us back to our car with an umbrella. 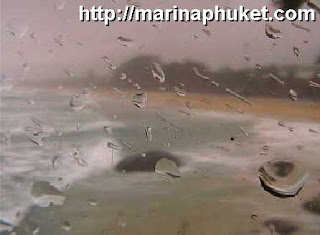 Above: Photo captured from the Karon beach live webcam about 5pm today. Yuk! Forecast looks like more rain for a day or 2, the weather radar is looking very moist... you can find loads of weather forecast and other links on the left side of the page. But at least it's sunny at Wimbledon! (above) Lovely... weather at Wimbledon.